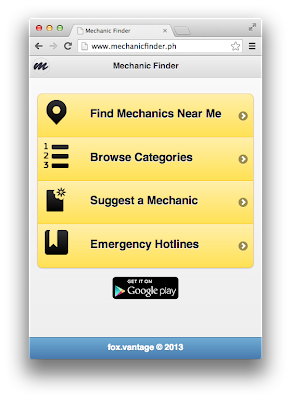 Mechanic Finder is first a web app then it has native app available in Google Play. For the purpose of this review, I'll use the web app version of the app. When you go to www.mechanicfinder.ph, you'll have a straight forward home menu. 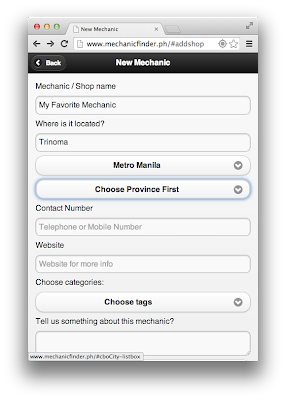 At the home screen, you will be able to access four (4) major functions: Find mechanics based on your location, browse the mechanic directory, suggest a mechanic and get the list of available emergency numbers (in the philippines). 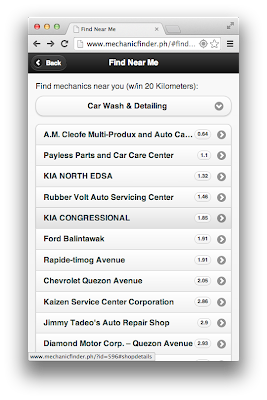 To search for mechanics near your current location, just click or tap "Find Mechanics Near Me" from the menu. 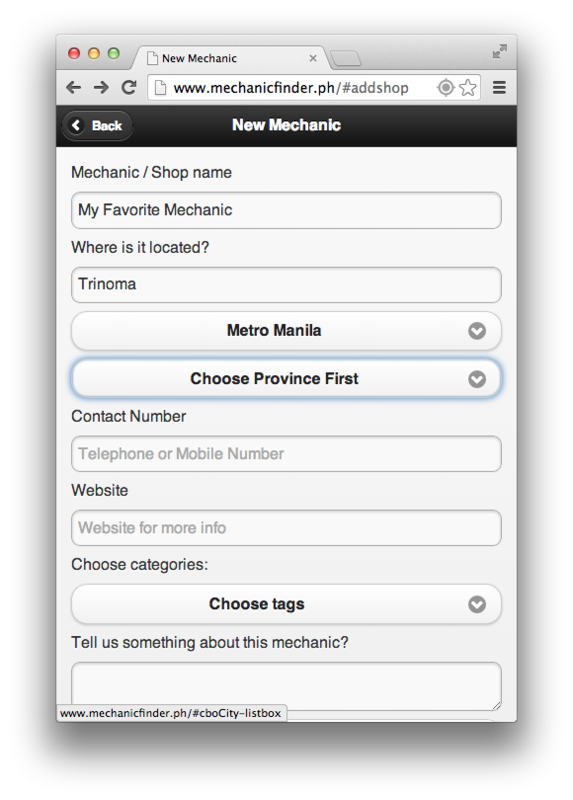 Choose the tag or category of the mechanic and after that it will show you the available mechanics within 20 kilometers of your location. To see the details of the Mechanic such as address, contact numbers and directions, click the desired mechanic from the result list. The app is also capable of showing you the route to your desired mechanic. 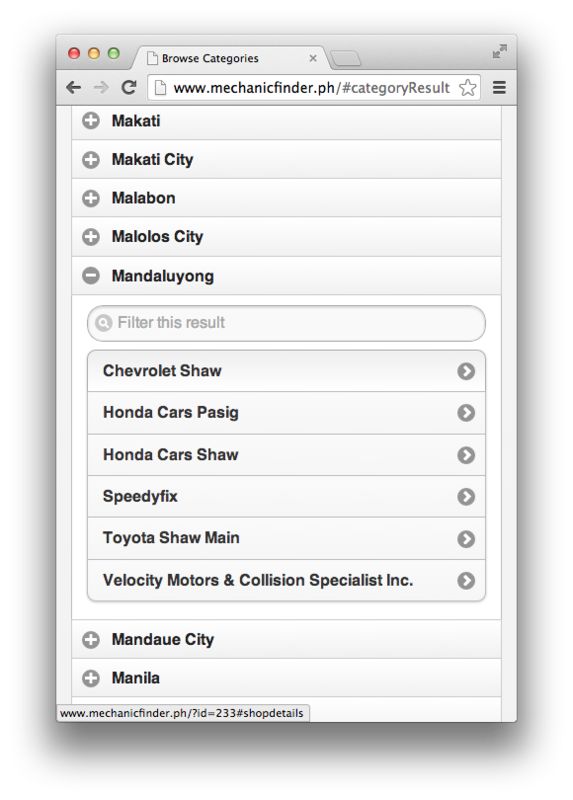 Just hit "Show me direction" button. If you prefer to browse the directory of mechanic then tap the "Browse Categories" in home screen. 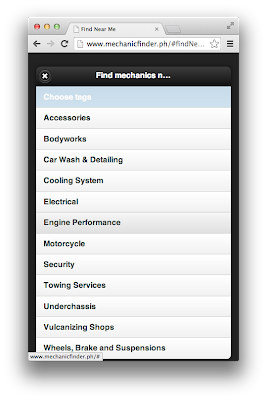 Click on any category to show the list of mechanics under it. 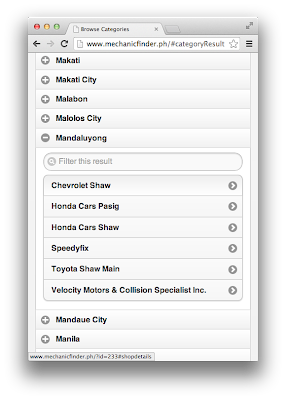 You'll be provided with a result that is group by city. Just tap on the city to show the mechanics located on that city. There are times you want to share your favorite Mechanic info. To do that just go to "Suggest a Mechanic" menu. 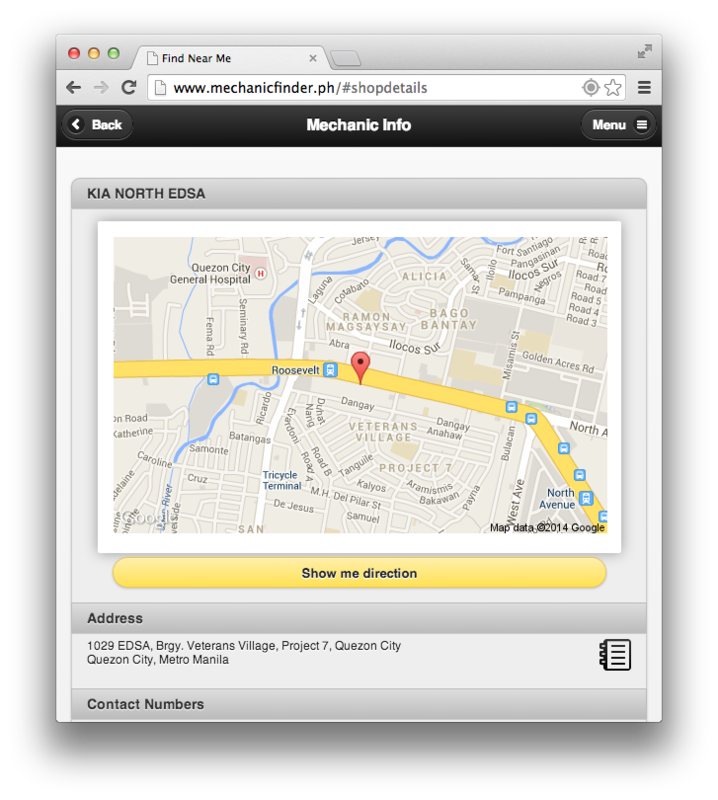 Fill-up the form like the address, contact numbers, website and geo location. All submissions will go through a review process before it can be added on the public database. If your using the android app version, any suggested app will be added immediately on your device. 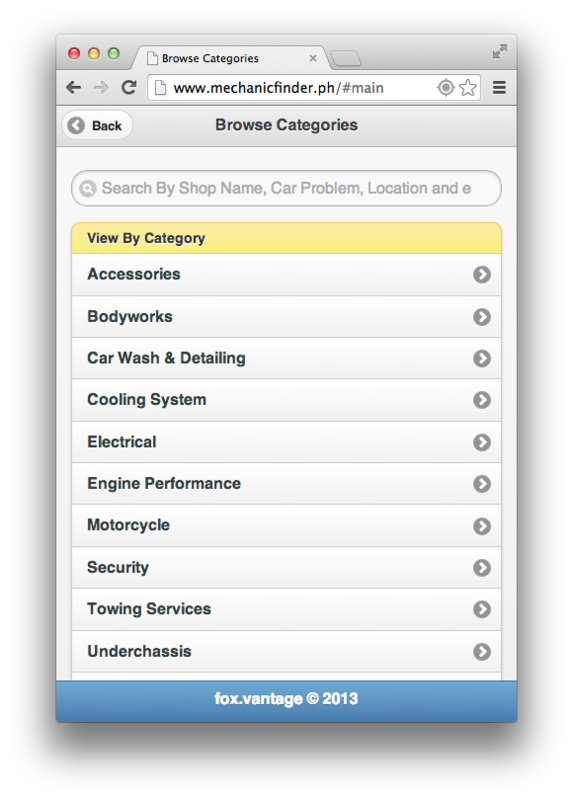 Aside from the top 3 features of this app, there are others that worth to mention. - Emergency Hotlines. 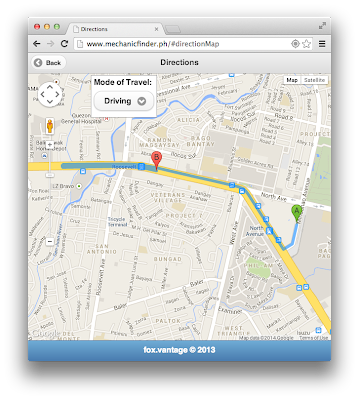 Very useful when you need help while on the road. - Favorite Mechanics manager. Only available in native app version.